The Walking Dead Review: "Do Not Send Us Astray"
Well, that didn’t take long. After praising The Walking Dead last week—as much as we’re really able to praise the show at this point—for giving us some compellingly stupid fluff, this week we were back in form with “bad stupid” Walking Dead. “Do Not Send Us Astray” was rife with inconsistencies and characters making decisions so monumentally boneheaded that you’ve got to start wondering if perhaps the walkers are actually the smartest creatures on this show. At least the walkers are consistent, right? Things started off rather opaquely, as Morgan is apparently quite insane once again, and is seeing visions of former Negan “top guy” Gavin, still sporting the hole drilled into his throat by the vengeful 11-year-old Henry. Throughout the episode he appeared to Morgan as some sort of Walking Dead force ghost—a little bit similar to when Lori used to appear to Rick after her death, if you remember that—saying little phrases such as “You’re supposed to!” and “You know what it is!” What do these things mean, Josh? Is it safe to assume they’re related to a contrived reason for Morgan to leave TWD and end up joining Fear the Walking Dead, as AMC has been advertising? Just how is this guy supposed to get from Virginia to Mexico, where FTWD takes place, anyway? 1. Tobin: He got stabbed in the stomach by a random Savior, so it was immediately clear that he was going to die, which robbed his transformation of most of its dramatic potential. We already knew that the Saviors had “gunked up” their weapons, so this was mostly a formality. And of course, in typical TWD fashion, they gave him a nice little closing bit of characterization in his conversation with Carol. A by-the-books departure for this show. 2. Tara: She was shot by an arrow, apparently in the arm, during the main firefight at the beginning of the episode, but it was EXTREMELY difficult to tell that at the time. This opening fight scene had all too much of the choppy, hodgepodge editing that has dogged this show in the last season—dark, ugly and frenetic all at once. I think it was Dwight that shot her, which implies two things: First, that he wasn’t shooting to kill, and second that he shot a clean rather than dirty arrow. Mark my words, Tara won’t get infected, because Dwight is ultimately on their side. 3. Rick: They really weren’t subtle with this one. Everyone is commenting on his cut/head wound, which he sustained in the last episode while chasing Negan. This is of course TWD using its own incoherence as a plot point, because we have no idea how he sustained that injury. Did it happen when both he and Negan somehow managed to crash their cars off camera? Or while smashing around in that abandoned building? Or did he get pricked with the deadly infection carried by Lucille? Also typical for TWD is the way that the injured Hilltoppers all managed to reanimate at exactly the same time to do the most damage, while somehow not displaying all the telltale signs of infection that would raise the red flags of everyone who has been living in this zombie apocalypse for years. How do a few dozen people all get injured and treated, but none of them display a sign that the doctors recognize as “the disease that destroyed the entire world we live in”? As always, the way that infection, death and reanimation is handled on this show varies in any given episode to suit the demands of the story. 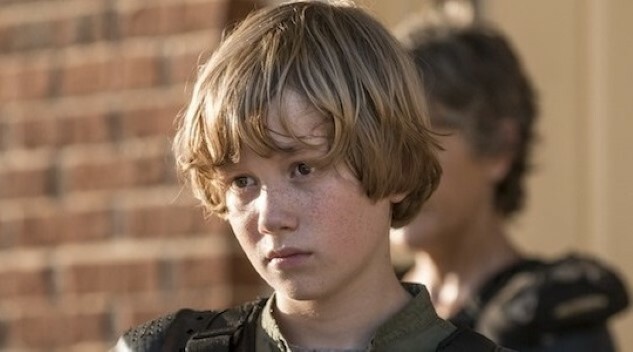 FINALLY, we need to talk about little psycho Henry, who starts off the episode asking to participate in the battle against The Saviors, and then makes an all-time TWD blunder by opening the cage with the Savior prisoners so they can escape more easily. I was laughing so hard while watching this sequence, Josh. You’re a kid with a rifle, and only the chicken wire of this (very flimsy) prison stands between you and 38 people who are desperate to escape. What do you do? A. Shoot through the open wire at people. B. Enter the cage with zero backup, in the interest of being more efficiently overwhelmed. I know what I’d pick! Where do we even go from here next week? Unlike last week’s show, I’m really not sure in the least. Maggie seems to have suggested that they don’t have the resources to remain at The Hilltop, so are they about to pack up and go somewhere? When do we check back in with Negan and Jadis? And where did Henry get to, after kindly allowing all the Saviors (including his brother’s killer) to escape? I can’t wait to find out the answers to these, and other exceedingly stupid, questions. There’s nothing so fluid as the speed at which people die from a walker infection and reanimate. Carl must have been an even tougher kid than we knew. The house at the Hilltop also must have really thick walls that nobody heard the attacks or the walker who literally bounced down a flight of stairs. And when Simon led his team right out into the killing field… nobody is really that stupid, right, Jim? I’ve got to believe that even if he was, some Savior henchman would have said, “Hey, just because it’s dark doesn’t mean they’re not just waiting for us to move from out behind this bus. Maybe let’s not walk super slowly into the open grass.” But yes, the creme de la stupid was the idea that wounded people with fevers would just be allowed to go unwatched during the night. Doesn’t anybody remember the prison? And why wouldn’t Dwight have taken the chance to shoot an arrow into Simon’s back? Why graze Tara’s arm instead of taking out Negan’s psychopathic lieutenant, which would have gotten him closer to whatever end game he actually has in mind? Nobody else was with them. Have Simon go first, shoot him in the back. The Saviors really do need Eugene to think for them, don’t they. Maggie’s plan was fine if a little overcomplicated—the Hilltop already had every clear advantage to repel attackers at their gate. But the follow through was for crap. Maybe post a guard at all times on your 38 prisoners so a dumb kid doesn’t unwittingly let them all escape. Maybe have some kind of safeguard against wounded people inside your house turning. And I know it sounds callous, but I really don’t care where Henry is. Why the Saviors who stayed don’t know where he is when he was last seen in a pen with a walker is beyond me. Wouldn’t one of them helped the kid? I think there’s no doubt that Tara and Rick are fine. Dwight wasn’t going to shoot Tara in the arm with an infected arrow. And despite how they kept teasing Rick’s wound (both Michonne and Siddiq talk about the cut getting infected), that would be the most anti-climactic way for him to leave the show. At least when we next see the Saviors with dozens of fighters, we’ll know how their unlimited supply of troops got replenished this time with Jared and the rest of the escapees. But where we go from here is anyone’s guess. Resources may be low, but where are they going to find a better supply? The Junkyard? Three more episodes, Jim: “Still Gotta Mean Something,” “Worth” and “Wrath.” If I had my guess, that last one is a reference to The Widow. Okay, neither of us has said a kind word. What can you find in this episode that was enjoyable or redeeming? It wasn’t the worst episode we’ve been given this season, so find some silver linings for me. I’m kind of grasping at straws for silver linings, if only because some of the question you raised just now are aspects of this episode’s stupidity that I didn’t even think of myself. You’re right—why wouldn’t the Saviors who chose to stay behind know where Henry is? They were there in the pen with him, after all. How many of them actually chose to stay, anyway? The only one we’ve actually met is the one “nice guy,” Alden. If you don’t know exactly who I mean, I wouldn’t blame you, as I just had to look up his name. But he’s the guy who’s always trying to get friendly with Maggie. I guess my kind word would be that, as you said, Maggie’s battle plan to engage the Saviors was pretty solid all around. She was thinking about the integrity of The Hilltop’s defenses in doing so. She knew that simply closing the gates against a force that size was likely to result in the gates being smashed down, and then they’d have a never-ending problem with the zombies. So she wisely lured The Saviors in to fight inside so she’d be able to shut her gates again when all was said and done. Thankfully, she had the aid of Simon not being able to spot the world’s most obvious ambush. I enjoyed him trying to channel Negan with the whole whistling bit. He’s like a little boy dressed up in his dad’s suit coat, trying to pull it off like The Walking Dead’s version of Vincent Adultman on Bojack Horseman. The more I think about it, the more it also seems odd to me that the show introduced Georgie in the way that it did last week. Was this woman, essentially a traveling knowledge salesperson, meant to come off as the leader of some well-to-do community? If so, why would she be the one spreading this message around, with only a couple of guards? Wouldn’t they have someone less valuable walking into the lion’s mouth in various communities? And why have we introduced her now, when there’s still a big, climactic thing left to wrap up with The Saviors? I really don’t know if I’m supposed to expect The Walking Dead to go forward with its “time skip” after this season or not, and her existence complicates things. As for now, I’d say that with three episodes left, we’re still in position for the following: Negan somehow shows up and kills Simon, taking command back of The Saviors. The two sides engage in a climactic battle. The Oceansiders show up and turn the tide, somehow. And I guess Jadis has to play into all of this somewhere, much as I would prefer her to simply walk out of the story when she’s been given so many chances to do just that. Those were some sad silver linings. I was going to try come up with some more positive things to say, but the first thing that came to mind was that the Hilltop seemed to respawn its own zombie fodder last night. Where did the replacement doctor come from? No sooner did she come out of hiding than she got eaten by her patients. There were so many nameless residents who got killed last night that it would have taken the Talking Dead’s In Memoriam would have been as long as the Oscars segment—and would have taught us a lot of names we didn’t know. Everything good about the episode centered on General Maggie Rhee and her plan to rout the Saviors. She did well, but the writers had to make sure we noticed by having every random Hilltop resident pat her on the back. Both sides were badly crippled last night, but the jailbreak probably tipped the scales in favor of the Saviors. I just hope next week is at least back to good stupid. That’s as high as my expectations go these days.